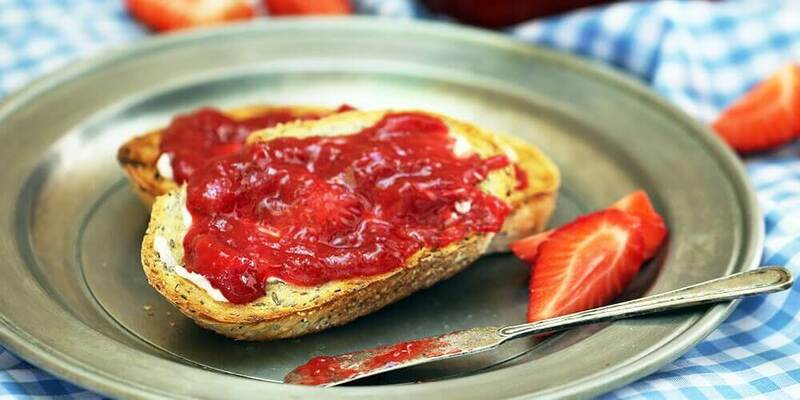 This is a simple recipe for homemade strawberry or blueberry jam; one of summer’s greatest pleasures. Standard jam recipes are loaded with sugar, but this low-calorie Sola® version tastes every bit as good and you don’t have to sacrifice your diet. Perfect for PB&J sandwiches, especially when using Sola low-carb bread, why not make some delicious sandwiches for your 4th of July picnic. Wash and hull the strawberries, then cut them into quarters and place in a saucepan. If you are using blueberries, wash them thoroughly. Add the water and Sola® sweetener to the pan. Bring the mixture to a gentle simmer and continue to cook for approximately 15 to 20 minutes until the mixture gains a thick, jam-like consistency. Remove the pan from the heat and let the mixture cool to room temperature.